Material and Finish: "Raven Black" powder-coated steel posts with mahogany wood top rail. 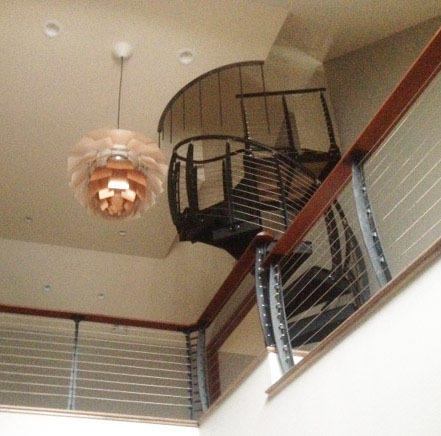 With minimal space to work with, our client in Watchung, New Jersey wanted a compact spiral staircase. The Keuka Studios team custom designed the steel staircase complete with our signature Keuka Style railing posts and a mahogany top rail. 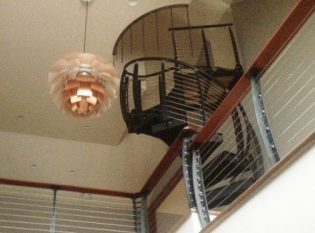 Visible from the main entrance of the home, this eye-catching staircase leads up to a loft library.